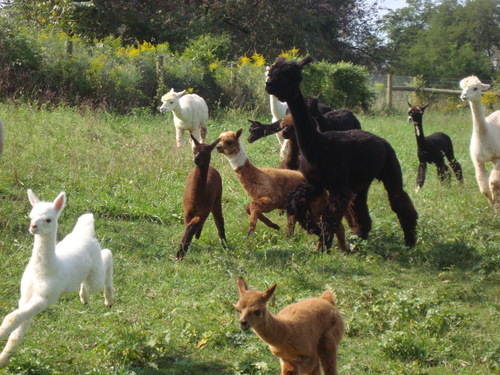 Back in 2008, Spring Grove Alpaca Ranch was just welcoming their first 18 alpacas that started this farm. 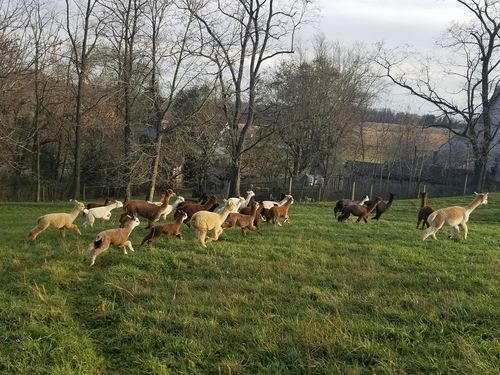 Up until then, Southern Lancaster County's favorite cow vet, Carl Troop, had done immense research on alpacas (after seeing one of those cute alpaca commercials and visiting many local alpaca farms, browsed available animals before choosing the starter herd that started Spring Grove Alpaca Ranch! Our farm has grown to averaging around 160 Huacayas, producing 10 to 20 crias per year and is run by farm manager, Erica Kell. 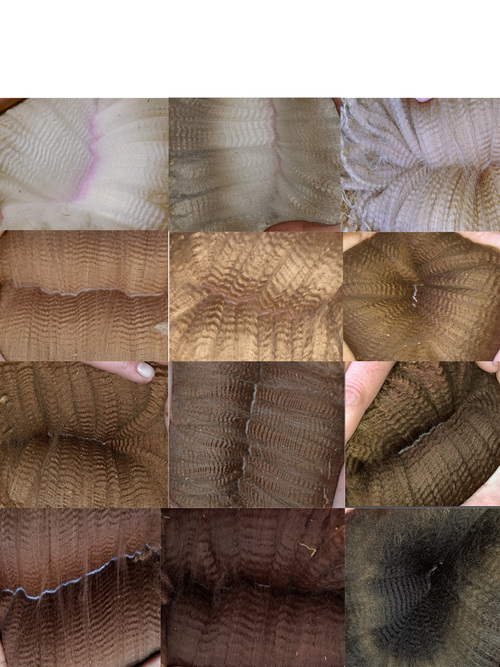 We show our animals and their fiber, we shear and process as much as we can and manage an online Etsy store! We love alpacas because they are seriously great animals to breed, raise and work with. Coming from a background of working with horses and cattle, you can honestly appreciate the almost simplicity of alpacas. Most of their normal maintenance, toenails, monthly shots, yearly vaccines, etc, you can learn to do on your own and handle right on farm! Plus, it's easier working with a 150lb body than 1500lb one...haha! The best part, in my opinion, is the breeding and producing part. You can SEE the results of your breedings in your babies and see the improvement with each generation, hence our farm motto! We take each breeding choice very seriously and smartly. We look at each fiber quality of the parents and what they've produced in the past, along with genetics and color before we decide on a pairing. We generally incorporate grey in most of our breedings (and we LOVE patterns and harlequins!!) so the potential is there for a grey producer but not strictly that so our animals are great for light/white and other breeders also! We offer endless help and support for those interested in giving alpacas a try and, of course, to our clients and alpaca purchasers! If you are unsure about alpacas and just want to do a trial run and come visit, check out the farm and learn some normal maintenance stuff, you let us know. Our farm is open to all! Our latest and greatest thing, as of late 2017, is alpaca embryo transfer. 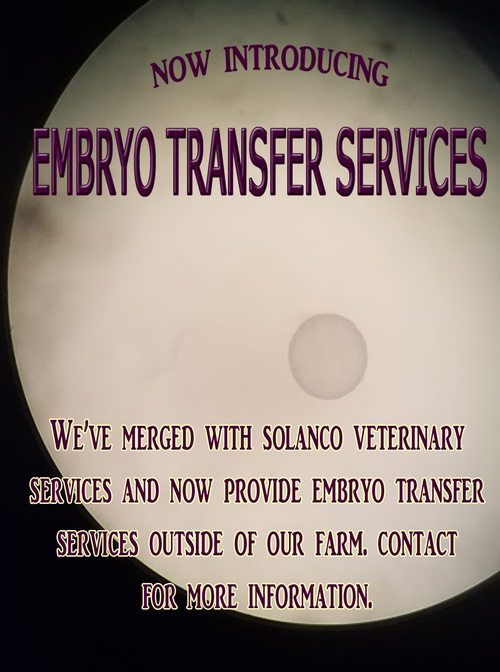 We are merged with Solanco Veterinary Services which means we can now offer these services to other alpaca breeders! Contact us for details and pricing! We generally are flexible and can allow for payments, if full payment is not possible, under contract. Good communication is always appreciated! Ask us about our embryo transfer services! Content copyright © MAPACA and it's respective members.